El Chico Cheese Enchiladas have long been a favorite of mine, these Tex-Mex enchiladas have a vegetarian sauce that is so easy to make. Armed with this recipe, you may not have to go out for Cheese Enchiladas again. I live in Houston, Texas. I went to high school and college nearby. El Chico is where we went for Mexican food when we had a special occasion. I actually went here with my Prom date years ago. El Chico is also known for their Fried Ice Cream, that will need to be a future blog post. This really isn’t Mexican food, but it is really Tex Mex, and this is something my wonderful state is known for. I love this style of enchilada the sauce is mild and it could be used for ground beef as well. I personally prefer the cheese enchilada over all others. For this recipe I am using American cheese, you can purchase it from the deli section of your grocery store. It melts very well, and it is the style of cheese that is used in this dish. You could use a Cheddar, and you may want to. I have had this dish most often with the American style of cheese. I know many of you may be alarmed at the amount of chili powder and paprika in this recipe, but you are making 1 quart of sauce. That is a lot of sauce. Here are some other similar types of sauces that are made in a similar vein. 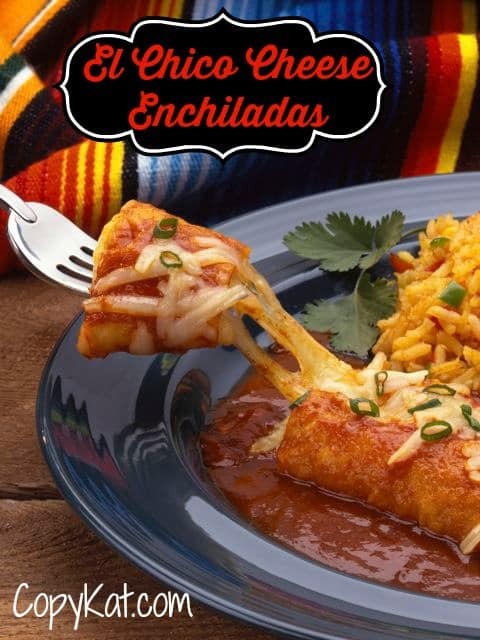 El Chico Cheese Enchiladas are some of the best Tex Mex Enchiladas out there. In a medium-sized pot combine vegetable oil and flour. Stir and cook for about 1 minute, or until this begins to become fragrant like pie crust. Add in salt, chili powder, and paprika. Stir to combine, begin to add in water, begin with 1/4 of the water. When the sauce becomes thick add in the next quarter of water, and repeat until the sauce is complete. Preheat oven to 350 degrees. Heat corn tortillas in either the microwave by sprinkling a little water on the tortillas and wrapping them in a clean dish towel, or heat them in a small skillet with a little vegetable oil. To assemble the enchiladas, spread a little sauce in the bottom of the dish. Place 1 1/2 tablespoons of cheese in the center of the corn tortilla and roll. Place the rolled tortilla in the baking dish. Fill the pan with your enchiladas and then top with the sauce. Heat for about 15 minutes or until the cheese melts. Some people like to add some chopped white onion on top. Can you use chicken broth instead of water? Does that make the sauce richer? Yes, the chicken broth also gives more flavor. We add chicken and rice to ours also. I did the sauce the way you did and added the 1 quart of water but my sauce came out too watery compared to yours???? I think she only added 1/2 quart in the video. She also didn’t use all the sauce she made on the enchiladas. Also, the written recipe says nothing about putting the rest of the cheese on top. Then you don’t put as much salt in , adjust for you . Y enchilada sauce the way that I was taught in Juarez, Mexico. I use an entire bag of red chilies, cumin to taste, Mexican Oregano to taste, salt, pepper and water. I blend mine in the blender and then cook it for at least 15 minutes. This is a quicker version. If you don’t like recipes in a blog, don’t use it. Please appreciate the bloggers efforts. I have their cookbook and this is their recipe for their enchilada sauce. Thanks for all the great recipes! I grew up in Shreveport, La and ate at El Chico once a week for many years. I haven’t lived there for over 30 yrs now and miss eating there. My favorite was cheese enchiladas but I keep thinking the sauce had small chunks of meat in it like chili. Was that the old version of cheese enchiladas sauce? It was little thick too like chili.